Bike-share memberships for Amsterdamers go live in October and a special pre-registration offer is available now. Amsterdam is the archetype of the cycling city, and one of the few places in the world that’s completely owned by cyclists. They make the rules, break the rules and basically leave you no choice but to rent a bike as well when exploring Amsterdam. The city of Amsterdam is as picturesque for its waterfronts as it is for its cyclists. For those of you who still find it hard to believe that bikes rule here, take this simple fact: there’s an estimated 800,000 bike in Amsterdam. Also, Amsterdam has around 400 km of bike paths and, put together, people cycle 2 million km every day in the city. Here’s another tip on how to escape the crowds and go where the locals go: check the Spotted by Locals Amsterdam blog! You’ll get insider tips by handpicked locals who clearly love their city and want to help you experience it like they do. They also have a 100% offline app, available on iTunes & Google Play (€3.99). Now, if you want to plan the perfect cycling holiday in Amsterdam, you’ve come to the right place. 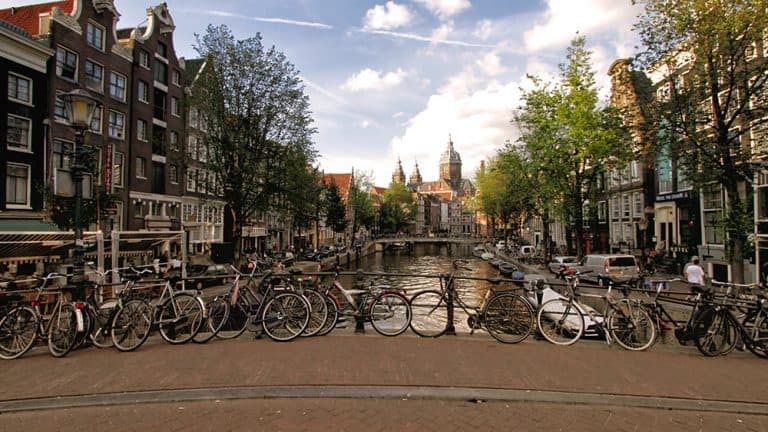 Read our recommendations on the best places to cycle to in Amsterdam, as well as tips and tricks to ensure you’ll stay both entertained and alive, so you can design your own bike tour of Amsterdam. After you get inspired – you’re welcome! – get your bike from one of the many Amsterdam bike rental locations you’ll find in the app. OK, let’s assume there’s no need for any introduction to this part of Amsterdam, its famous Red Light District. Let’s also assume you’ll want to do more around here than stare at racy dance numbers in red-lit windows or idle inside equally famous coffeeshops. 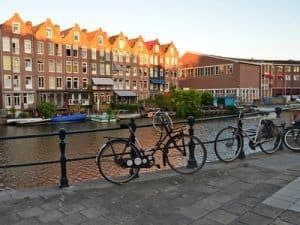 In this case, you can ride your rental bike on Zeedijk, the popular street in what’s known as Amsterdam’s Chinatown, from Centraal Station down to Nieuwmarkt. Nieuwmarkt is a large town square that hosts an open-air farmers market on Saturdays – totally worth a visit. 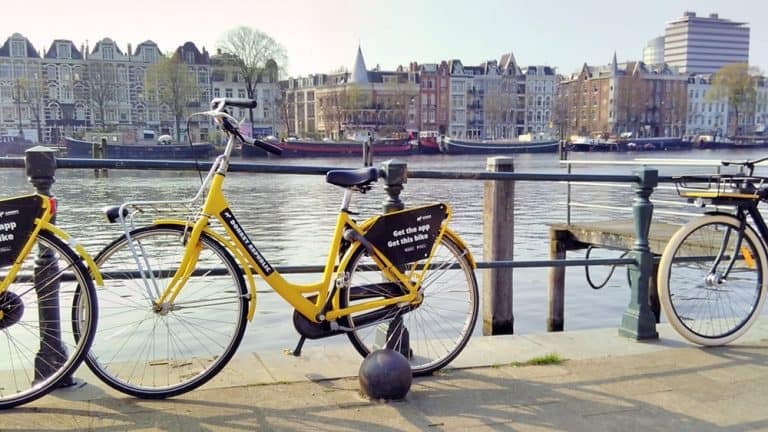 It’s also a perfect place to park your rental bike and indulge in some people-watching and picture-taking, as there are plenty of cafés, bars, restaurants, and a nice scenery with the backdrop of the popular building of the Waag (Amsterdam Weigh House). Amsterdam’s central area is marked by its most famous landscape feature – the Canal Ring. 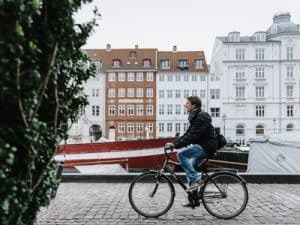 You could definitely spend a whole day just riding your rental bike along the city’s emblematic canals and be a happy tourist. 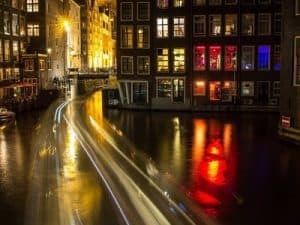 But in case you want to make a few stops, consider these unmissable attractions: the floating Bloemenmarkt flower market, the Amsterdam Dungeon, the Royal Palace of Amsterdam, the NEMO Science Museum, and looots of Amsterdam’s typical browncafes. Don’t leave the area without a visit to Anne Frank’s house, the one where she wrote her famous Diary of a Young Girl while hiding from the Nazis at the beginning of the 40’s. On your way there, look around: you’re riding your rental bike along one of Amsterdam’s most popular canals – Prinsengracht. 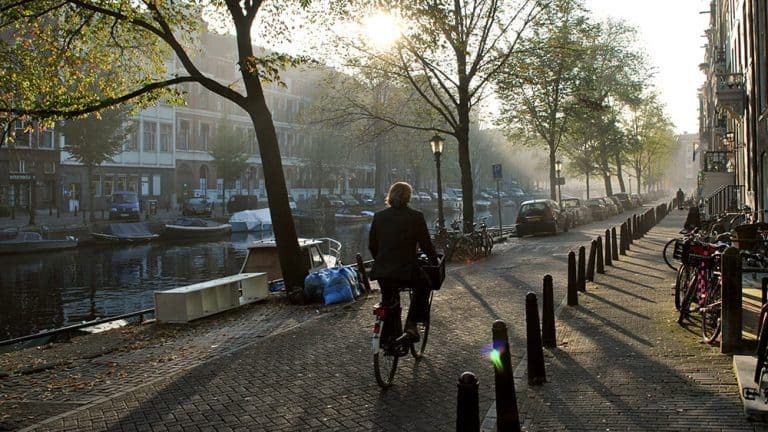 Visiting the district of Jordaan on a bike is the smartest idea you’ll ever have. This very popular area has developed as a heaven of mazy streets, groovy cafés with terraces on scenic waterfronts, art studios, and the best flea and farmers markets in town. While on your rental bike, you might stumble upon either Lindenmarkt (Saturdays), Noordermarkt’s famous biological food market (Saturdays) or flea market (Mondays). All of them are really cool and very popular among Amsterdammers, with even the occasional local celebrity strolling through. If you visit Amsterdam at the end of the summer, you might be lucky enough to happen upon the Jordaanfestival. This is Amsterdam’s most famous street party, with great local artists playing their music, games, cabaret and sing-alongs – here’s how it usually looks like. Always use hand signals to communicate your intentions while riding your rental bike. One hand straight up means stopping, right hand to the side – turning right, left hand to the side … you get the drill. Don’t bike more than two people across, keep pace with the other cyclists, and pull over to answer your phone or check the map. Amsterdammers are notorious for breaking the rules: cycling through red lights or biking at night without lights. Don’t go full local and stay safe on your rental bike. This one might not seem as obvious when talking about Amsterdam; let’s face it, everybody comes here to get shitfaced. Still, never cycle under the influence of alcohol or drugs. Just don’t. It’s easy – and super annoying – to get your tires stuck in the rails. Cross them at a sharp angle. As soon as the sun sets, turn on the lights on your rental bike. This is how you avoid a serious fine as well as, you know, falling off your face.